Contemporary large-scale paintings and sculptural hybrids are on view in NO MAN’S LAND: Women Artists from the Rubell Family Collection. The exhibition imagines a visual conversation between 37 women artists from 15 countries exploring images of the female body and the physical process of making. 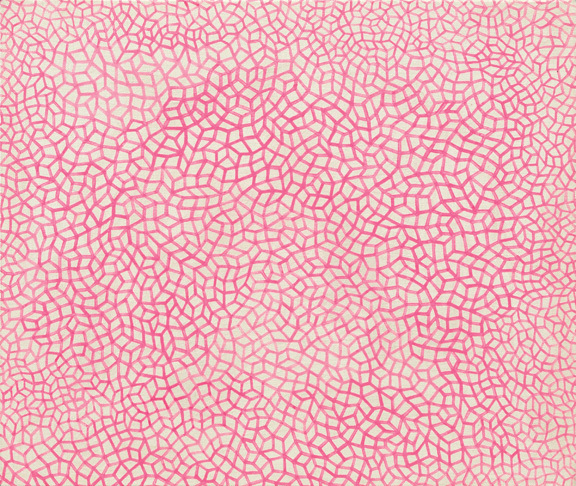 Yayoi Kusama, Jennifer Guidi, and Anicka Yi construct contemplative works that invite viewers’ sustained attention. 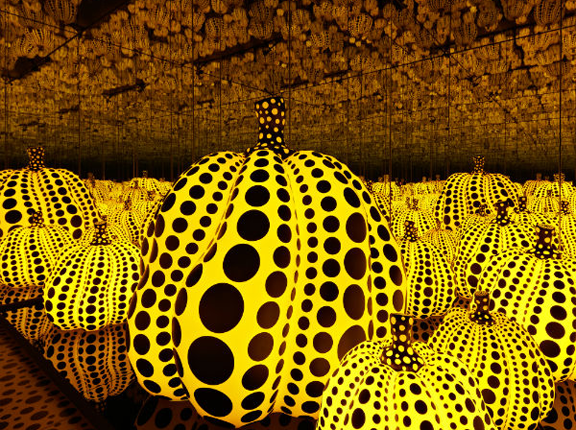 Kusama plays with the paradoxical idea that infinity can be captured within the confines of a canvas. INFINITY NETS (H10) comprises a pink lattice of nets against an off-white background. The composition’s web of lines tighten toward the edges of the canvas, mesmerizing the viewer and prompting reflection. Jennifer Guidi (b. 1972, Los Angeles) began her artistic career with realistic paintings influenced by the southern California landscape. Inspired by woven patterns, Guidi turned toward abstraction. “Growing up, my grandmother taught me how to sew, knit, and crochet. I still love the repetitive motion of hands making things,” she explains. Individual dabs of paint in deliberate rows against a black background compose Untitled (TRF #3 Black, White and Red). Guidi seamlessly switches from white dots to crimson for the lower third of the canvas. 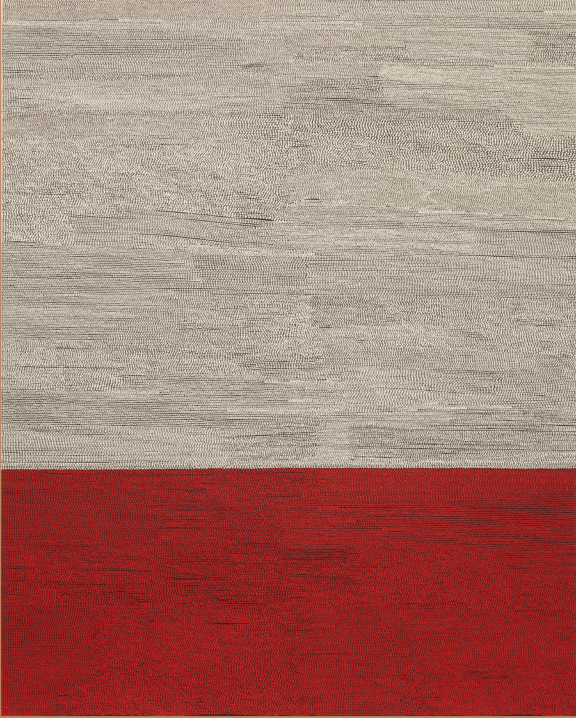 The painting’s textured effect reveals Guidi’s interest in tapestries and the backs of rugs. The magnitude of the painting encourages visitors to view the work at a distance, while its stitch-like marks draw visitors in closely, prompting contemplation and meditation. 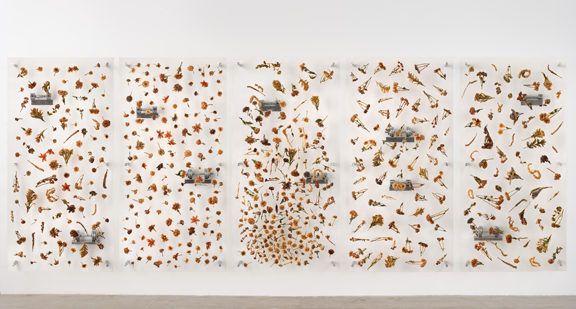 Tempura-fried flowers, resin, Plexiglas, stainless-steel shelves, and chrome-plated dumbbells make up Anicka Yi’s large-scale five-panel work. Yi (b. 1971, Seoul) explores ideas of ephemerality and materiality. 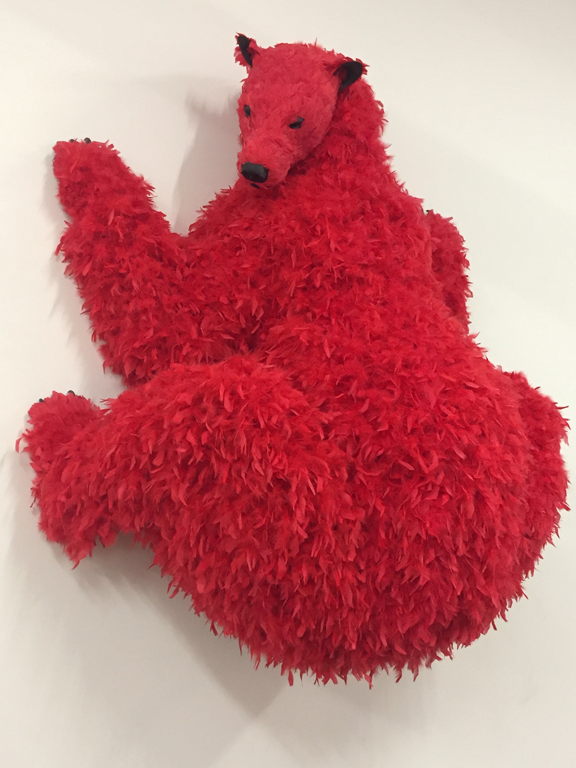 “I’m interested in connections between materials and materialism, states of perishability and their relationship to meaning and value, consumerist digestion and cultural metabolism,” she states. Yi works with biologists and chemists to help predict how particular materials will transform over time. 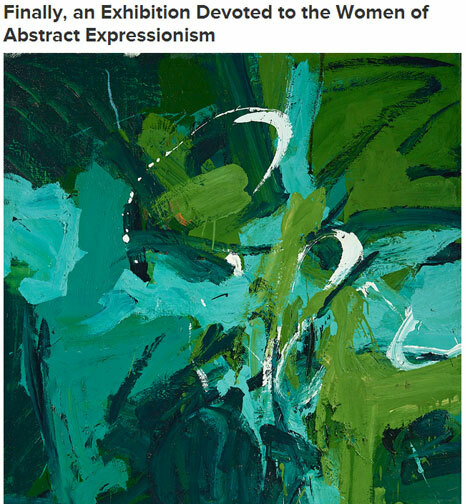 Sensory elements are critical to Yi’s work, which often exude a fragrance. The tactile and olfactory qualities of her work make them uniquely engaging and thought-provoking. The New York Times draws parallels between Goldin’s signature work, The Ballad of Sexual Dependency, and the current culture of image sharing. Yayoi Kusama: Infinity Mirrors, organized by the Hirshhorn Museum and Sculpture Garden, will travel to four additional museums in North America. 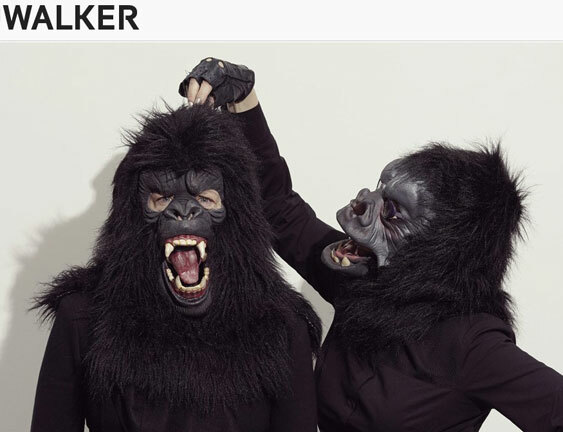 The Art Newspaper and artnet share the excitement. Colombian sculptor Doris Salcedo tours Bogotá and her studio for the Guardian. Polixeni Papapetrou uses flowers from a cemetery to explore themes of mourning and remembrance. The Brooklyn Museum will celebrate the tenth anniversary of its Elizabeth A. Sackler Center for Feminist Art. 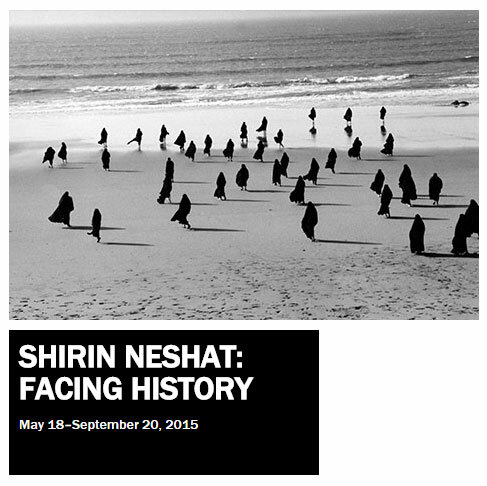 The Art Newspaper explores Shirin Neshat’s two new video works. Artsy profiles the Neo Naturists, a “body-painting trio of female flashers” that started an underground art movement in the 1980s. The Huffington Post shares a list of ten exceptional women photographers. In LACMA’s new video series, Catherine Opie discusses a painting by Thomas Eakins in the museum’s collection. 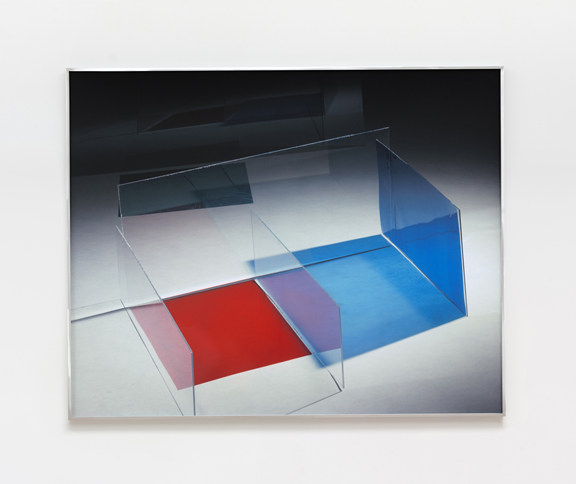 A new solo exhibition presents three recent bodies of work by Barbara Kasten. Photographer Lisa Minogue creates stylized portraits of Australian women of color by using vibrant face paint. In her “Reading Women” series, Carrie Schneider photographs and films women artists reading works by their favorite women authors. artnet shares five interesting facts about Italian artist and activist Tina Modotti (1896–1942) on the anniversary of her birth. A rare letter by pioneering travel writer Mary Wortley Montagu goes up for sale. The Guardian discusses revolutionary Australian feminist films of the ’90s. After her directorial debut, Natalie Portman discusses the status of female directors in Hollywood. Hyperallergic delves into Chantal Akerman’s 1975 film, Je tu il elle. NPR finds “a brave sense of modernity and freedom” in The Art of Romaine Brooks at Smithsonian American Art Museum. artnet shares a sneak-peek at Yayoi Kusama’s new works at London’s Victoria Miro Gallery, involving paintings, pumpkin sculptures, and mirror rooms. FBI Special Agent Meridith Savona tells ARTnews about her career investigating art crimes. Hollow, an installation by Katie Paterson uses samples of wood from 10,000 different trees collected by the artist over three years. 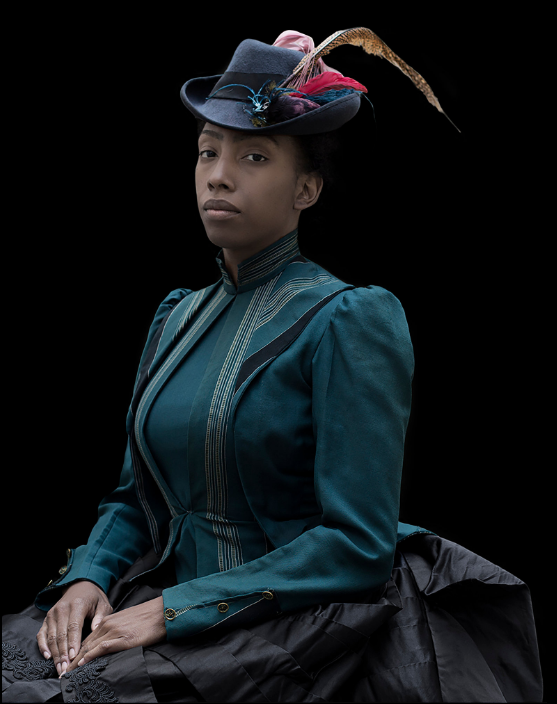 “I am fighting photography with photography,” says Ayana Jackson. In her work, Jackson explores how photography shaped the narratives of African-Americans and Africans. Cindy Sherman’s new photographs take inspiration from 1920s-era film stars. The Georgia O’Keeffe Museum in Santa Fe, New Mexico purchased a rarely seen abstract O’Keeffe painting titled The Barns, Lake George (1926) for $3.3 million. “The virtual is compelling because it mixes the artificial with an unpredictable sense of the real,” says Claudia Hart about her 3D simulations. Mexican conceptual artist Minerva Cuevas’s site-specific interventions address social and political concerns. “I’m inspired by errors,” says 78-year-old Hungarian artist Dora Mauer in an interview with the Telegraph. The Art Newspaper profiles several of China’s rising female artists—who are still overwhelmingly outnumbered by their male contemporaries. Elaine Reichek embroiders expressive tableaus inspired by ancient Greek mythology. Olek re-creates a massive, crocheted front page of The New York Times to drape over the facade of the Virginia Museum of Contemporary Art. The Guardian charts illustrator and journalist Molly Crabapple’s path toward sketching in Guantánamo Bay and publishing her memoir, Drawing Blood. A new book by Anna Beer profiles women composers dating back to the 17th century. Design critic Alice Rawsthorn discusses why some of the greatest designers tend to be outsiders. Mami features works by women artists of African descent, revolving around Mami Wata—the water spirit revered in West, Central, and Southern Africa, and the African diaspora. 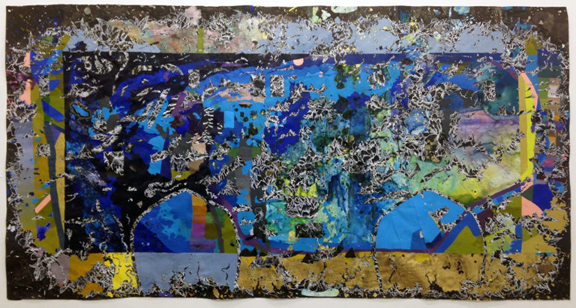 Los Angeles-based artist Nicole Miller investigates the landscapes of marginalized communities through the lens of socioeconomic status, race, and gender in Every Word Said: History Lessons from Athens and Tucson. In celebration of the 500th post on the Broad Strokes blog, the museum is launching a new weekly blog series that pulls together recent art news highlights and takes the pulse of women in the arts. 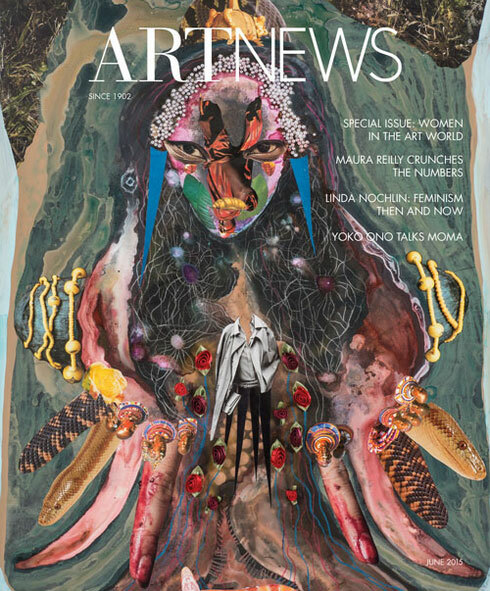 The June 2015 issue of ARTnews is dedicated to women in the art world. In the last ten years, there has been a 10.6% increase in women-led museums, although mostly in museums with smaller budgets. The highest price paid for a work by a living woman artist is $7.1 million for a Yayoi Kusama painting, whereas the highest result for a living man is an editioned sculpture by Jeff Koons for $58.4 million. In their annual list of the 100 most powerful women in the world, Forbes did not include any artists or art world professionals. An analysis of six major literary awards shows that novels about women are less likely to win. Research found that zero women writing female-centric works have won the Pulitzer Prize in the last 15 years. The Financial Times reports that only 22% of people working in the games industry are women, although women make up almost half of players. Recent mentoring initiatives are intended to help close this gap. Lynda Benglis’s gargantuan Water Sources sculptures take over Storm King Art Center. Visit the Huffington Post for some amazing photography. A solo exhibition of Iranian-born artist Shirin Neshat prompts discussions of Islam and gender issues at the Hirshhorn Museum and Sculpture Garden. Japan Times writer Alice Gordenker covers two exhibitions in Japan featuring historical works by lesser-known Japanese women artists. For more facts and figures about women in the art world, visit the Advocate section of the museum’s website. Check back for future installments of Art Fix Friday!